Epos Epic 1 review | What Hi-Fi? 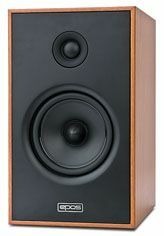 Epos, like most of its rivals, has had a varying degree of success with its speakers over the years. With every new range comes the hope of striking gold, and this latest Epic range is no different. There's plenty of the traditional Epos style in these Epic 1 bookshelf speakers, even if they do feature a 25mm soft-dome (as opposed to metal) tweeter - a first for Epos - with a new 13cm midrange driver. The front baffle is smart, with no visible screws or holes. You can also push out the front panel using a hole on the back of the speaker and swap it for a different finish, too. There's choice of a cherry vinyl or a black-ash veneer for the casing itself. We kick-off our listening with a run through Kanye West's My Beautiful Dark Twisted Fantasy, an album with sufficient variation to give your system plenty to think about. The bass note loop at the start of Hell Of A Life shows the Epics are capable of plenty of depth and power, while the broken beats that drive the track prove they time well and remain organised. That bass power comes with plenty of punch and impressive dynamics, as a burst of Biffy Clyro's Justboy demonstrates. However, motion the Epics to calm down a touch and they're less comfortable. If it's an punchy and exciting yet organised listen you're after, this set of Epos speakers could be the answer. But for the money, a little more attention to detail can be found elsewhere to make the complete all-rounder.